Susi Cora’s art practice comes from a lifelong interest in the natural world. Her childhood in a rural dairy-farming community in New England brought her understanding of the work of one’s hands and the knowledge gleaned from observing nature. “Our eyes watch the skies for changing weather and scan crops to know when to harvest. The soil tells a story as does the behavior of animals. Our hands plant seeds, harvest hay, shear sheep and give a friendly scratch to a passing cow. It is a visual and physical life bound to nature.” With her art, success is contingent on the interaction of a myriad of components as well—from concept to clay, organic matter, minerals, and fire. Cora’s work is process driven. She begins by sketching out ideas to explore how to best communicate the concept to determine how a piece will be supported; whether it will stand independently, be attached to the wall or sit on the floor. These considerations include what type of clay is to be used, construction methods, whether to glaze the piece, and how to fire it. 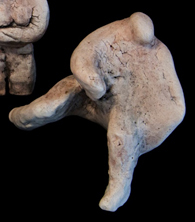 If the sculpted work is to be pit-fired, as is often the case, Cora forms a pit in the ground, then carefully lays a fire and positions the work. Igniting and tending the fire requires vigilance to keep it from burning too fast or too slowly. She generally does not glaze pit-fired pieces, instead including minerals such as copper carbonate, salt and fertilizer, and organic materials, such as coffee grounds and banana peels, as she builds the fire to impart color and texture to a piece. If the work is to be fired in a conventional kiln, she formulates glazes for the pieces, usually choosing a matte or crackle finish. “You have to be a chemist as well as an artist to do this work,” she says. Highwire includes both pit-fired and kiln-fired pieces. The smaller kiln-fired Emerging Figures sculptures are not glazed. “I was looking for simplicity, and I wanted the form to guide the discussion, rather than an applied decoration,” she says. Cora draws inspiration from the work of Polish sculptor Alina Szapocznikow who said “My gesture is addressed to the human body. I want to exalt the ephemeral in the folds of our body, in the traces of our passage.” The constructed, eroded, and decaying surfaces of Italian painter and sculptor Alberto Burri are another influence. “These artists engage intellectual and physical senses and then leave space for personal contemplation,” she says. Susi Cora is a visual artist who works in Alexandria, Virginia and Washington, D.C. She trained as an architect and is a graduate of the School of Architecture at Rensselaer Polytechnic Institute. She completed the Master of Fine Arts program at The George Washington University in 2016. See Cora's Highwire exhibition at Touchstone Gallery, 901 New York Ave NW, Washington DC. Opening Fri May 4, 6-8:0 pm; Meet the Artist Sunday, May 20, 1-3 pm.